I slept but my heart was awake. Listen! My beloved is knocking. Besides this, you know what time it is, how it is now the moment for you to wake from sleep. For salvation is nearer to us now when we became believers; the night is far gone, the day is near. During Advent this year I plan to focus my weekly posts on the lectionary readings (Bible passages) assigned by the church calendar. Vanderbilt Divinity Library offers a convenient lectionary overview online, just hover over the reading and the text appears on your screen, or click on the reading to see all of the readings for the week. I find that following the lectionary from time to time exposes me to a wider variety of passages than I might otherwise choose to read. Like many of my friends - online and in person - I found myself turning to the comforts of the Christmas season early this year. JJ Heller's new album, "Unto Us" has been on repeat as I make dinner and the lights we hung outside last year (and didn't take down . . .) were ready to go and plugged in the day after Thanksgiving. Many are struggling in the wake of a tumultuos election, others are worn and weary from carrying burdens of every shape and size and we long for the comforts of Christmas as the days grow short and cold. But this week's passages reminded me that Advent brings more than comfort - it first brings disruption. The prophets of advent speak of an overthrow of what is in favor for God's kingdom which is to come. Advent seeks to unsettle us, to wake us up that we might be ready for the unexpected ways of the One who comes to turn the world as we know it - broken, beaten and rife with violence - into a place where the lion lays down with the lamb and swords are beaten into plowshares. This week's readings remind me that Advent brings revolution and bids us stay awake. The temptation is fierce this year to use the distractions and delights of the holiday season to placate our longing and need for light in the midst of darkness. 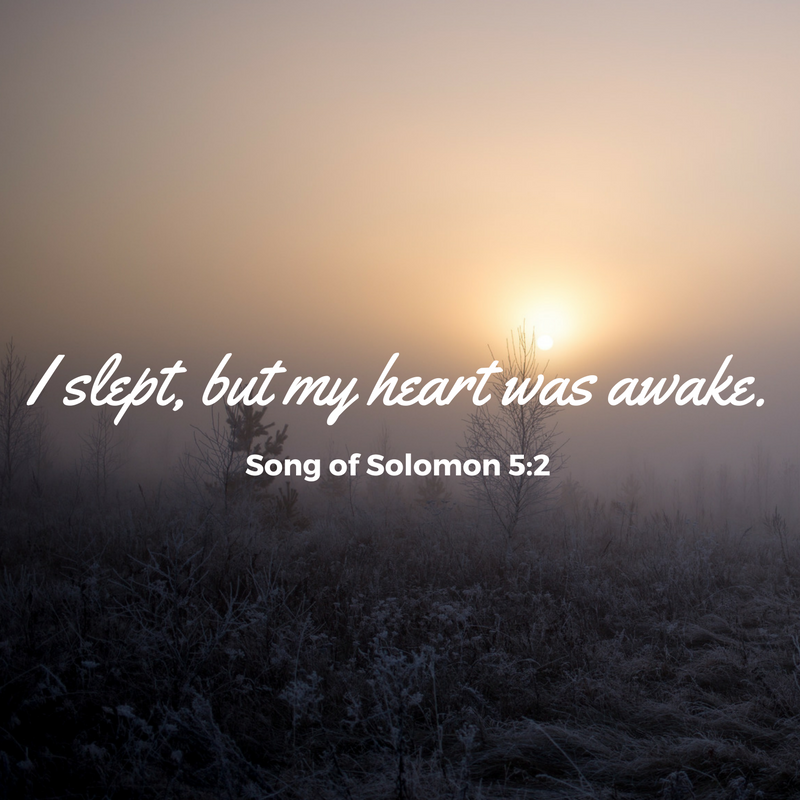 Like the apostles waiting in the garden with Jesus, we are too easily lulled to sleep in the long, dark night of waiting. Let us stay awake this year, let us wait in darkness and with wonder. Let us read old verses with new eyes, let us be willing to suffer the disruption that precedes redemption, the death that precedes resurrection's glory. What practices will help you Stay Awake in this season of waiting? I love your thoughts on the disruption of the Christmas message. We misrepresent it sometimes, but all those angel visitations and their startling birth announcements would have felt like upheaval in the moment, and for shepherds who had never seen anything brighter than the light of their own campfire, the glory of God on a dark night must have been truly terrifying. Yes, our pastor spoke Sunday about how disruptive a birth can be and the adjustments to it, I think it's so important we don't skim over the rough edges of Advent - when we do, we do a disservice to the rough edges of our own lives. I enjoyed reading your post today and look forward to reading the next ones! Such an inspiring message and bringing up the thought that during the days of Christs' birth, that there was upheaval - in part, due to the shepards seeing the bright star of Bethlehem as they probably wondered what was beyond the horizon of light. For me, this message for today, reminds me that Christ is the light within the darkness - leading and guiding our paths. For The Three Wisemen to ignore King Herod's commands and be led by the shining star, tells me that, we too, are led daily, but we must be attentive like The Three Wisemen, to follow the signs that will light our souls and life up. Oh such wonders meet The Three Wisemen as they reach the manager where the baby Jesus lie sleeping. It gives me goose bumps and wonder just thinking of Christs' birth! Thanks for being here, Faith. Yes, it seems to be the pattern, Lisa. I am wanting to read the old verses with new eyes this season, too! Praying God's Shalom during this special season! I hope you enjoy the book, Heather. A friend just recommended several and I'm looking forward to finding some new stories for the season. How can I "stay awake"? Excellent thought to ponder, Kelly. I've decided to shut out the noise of Facebook (other than Glory Writers)and make room to listen. Your post reminds me to be intentional about looking, too. So well put. Thank you.